Mt. Rainier played host to a wonderful summer season of meaningful connections and vibrant beauty. The experience could not have been more perfect. The ribbon that tied this beautiful gift together was the entire staff, in particular, the team of interpreters I had the pleasure to spend time alongside at training, the visitor desk, the employee lounge, on the trails, or during social nights. 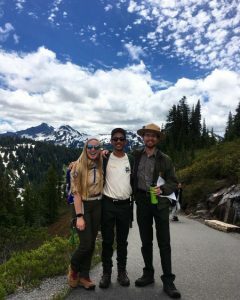 Crossing paths while roving with Geoscientists-in-the-Parks intern Savannah Sanford and park ranger Joel Hines. Photo by anonymous park visitor. 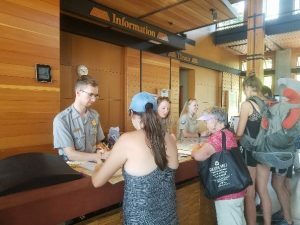 Interpretive park ranger staff Joel Hines, Kayla Borderlon, and Savannah Sanford providing information to visitors at the Henry M. Jackson Memorial Visitor Center desk. Photo by self. 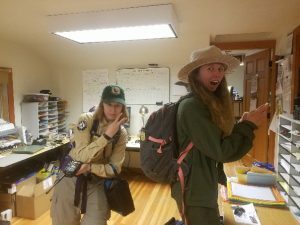 Astronomy park ranger Tina Seeger and astronomy Geoscientists-in-the-Parks intern Katie Billings preparing for a night of stargazing. Photo by self. 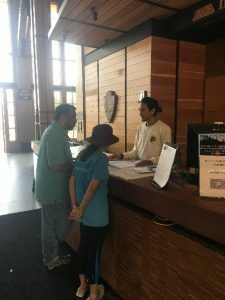 Assisting visitors at the Henry M. Jackson Memorial Visitor Center desk. Photo by Katie Karnes. Mt. Rainier has offered so much love, generosity, inspiration, and insight. I am in bliss and fortunate to have lived through this experience. I hope you readers were inspired to visit the mountain. I suggest hiring a driver so you can “ooo” and “ahh” through the numerous switchbacks and hairpin turns without worrying driving into the valleys and canyons. An adult summer camp I will never forget, I hope to return to the mountain sooner than later. In fact, after the Mosaics in Science conference in Colorado, I will be returning to the park to be an official interpretive park ranger until September 10th. Catch me on the trails or at the visitor center! Icebreakers at the Mosaics in Science conference in Colorado. Photo by self. Great blogs. Back in Mt. Rainier, after the Colorado meeting? Looks like you’re finding what you want to be. Graduating will be a breeze.